It's moving day, and your La-Z-Boy couch needs to go through a narrow doorway. 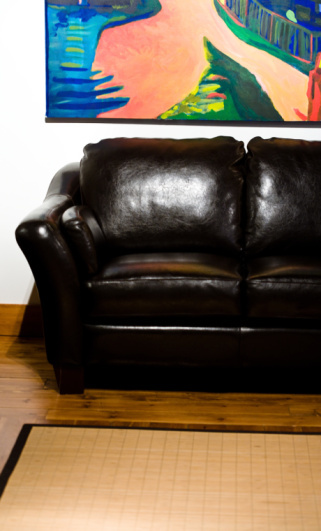 The company manufactures numerous couch models, but all are made differently. La-Z-Boy's motion sofas that recline are made to come apart, while its stationary sofas are not. All feet on La-Z-Boy sofas are, however, either bolted or screwed on to allow for a few extra inches clearance when moving your couch. Dismantling your sofa, to the extent allowed by the particular model, is a simple process. Ask for your model's instruction booklet at the store when purchasing your La-Z-Boy couch. Measure your doorway or the space you need to clear before taking apart your couch, and also measure the couch. If the clearance is close, try squeezing the sofa in carefully at an angle to avoid dismantling your La-Z-Boy. Remove all loose cushions. Any La-Z-Boy couch with motion seats built into it has two levers located on the back of each couch section in the bottom corner. Your sofa may have a fabric flap covering these hinge levers. Pull up the levers to lift the section off the brackets and slide it off the couch. Each seat slides into its own set of brackets. The seat backs come off by lifting them straight up, but you may have to push in on each side where the hinges attach. Reverse the procedure to put the couch back together. Remove the feet on a stationary La-Z-Boy sofa that won't come apart. The feet are bolted or screwed on and can be removed with a Phillips screwdriver or a Torx screwdriver.